When people talk about Intel’s Haswell, the conversation centers on power management and battery life. 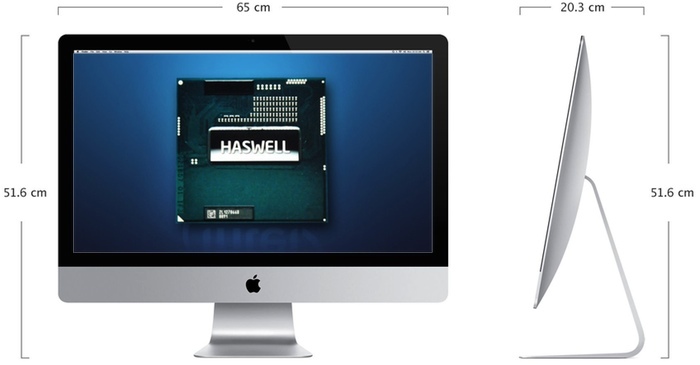 True, but the new chips in the desktop are cooler, more efficient and offer much improved integrated graphics performance — enter the Haswell iMac. Quoting KGI Securities analyst Ming-Chi Kuo, who has a fairly strong record, Macworld UK reports that Apple’s Haswell iMac update could arrive as soon as late August. That said, given that Apple rolled a major design update last year, we likely shouldn’t expect much in the way of design changes in the 2013 iMac. So, Apple’s Haswell all-in-ones will look and be functionally the same as the 2012 models — the differences will be under-the-hood. Again, the changes won’t be headline making — somewhat faster at the same clock speed, greatly improved integrated graphics performance, more efficient vis-a-vis power and cool. DigiTimes adds a little color in saying that all-in-one desktops will increase by about 17 percent in the second half of 2013 with Apple’s iMac leading the way. And, for what it’s worth, KGI’s Kuo adds that Haswell MacBook Pros, both Retina and traditional models, will arrive in the mid-September.